Fire was a gread hazard in olden times and the strongly build "kura" were one way to protect one's property. Most farm estates in my area in Okayama have a kura, a special storehouse for the family treasures. It is used to protect things from earthquakes, fires and hurricanes. The strong walls are fireproof and the windows are very small with fireproof shutters. The strong doors are fireproof too. The timber used for a kura was covered with clay and then with a plaster finish. The roof consists of heavy tiles to withstand storm and fire. Sometimes even the walls have a row or two of tiles to make a way for strong rain blown on the walls during a typhoon. This kind of wall is especially common along the seaside towns of Japan. The doors had special locks to prevent thieves and burglers from their work. joo, kusari 鎖 is a chain that can be used with a lock.
. asagao ya hiru wa joo orosu mon no kaki . The walls were often strengthened with plaster, in various geometrical patterns. These "namako kabe なまこ壁" are especially beautiful in their contrast of white and black. The black parts of this wall are made from flat black tiles, hira gawara ( 平瓦（ひらがわら）. The roofs of a storehouse were rather small in their overhang, to prevent a fire from being pressed down on the walls, and the tiles on the bottom of a wall were fireproof and also protected from the rain. The beautiful black finish of these walls is very typical of some regions, where they get many extra layers of a special laquer 黒漆喰. The door was built in some steps, each covered with mortar made of mud, so the fire sparks would not come in. This is called "kakego painting, kakegonuri 掛子（かけご）塗り. Look at my collection of window shutters at a storehouse in Katsuyama ! More "plaster paintings" as decorations for storehouses, kote-e 鏝絵 （こてえ）. Click on the photo. (Iri-e Choohachi) of the town of Matsuzaka (Shizuoka prefecture), where you can see a whole museum full of his artwork. Kawagoe's fortunes owe everything to its strategic position on the Shingashi River and Kawagoe-kaido, the ancient highway to the capital. If you wanted to get goods to Tokyo, then called Edo, they more than likely had to go via Kawagoe, thus the town's merchants prospered as a result. They accumulated the cash to build fireproof kurazukuri, the black, two-storey shophouses the town is now famous for. At one time there were over 200 of these houses, but their earthenware walls didn't prove quite so effective against fire as hoped (nor were they much use in the face of Japan's headlong rush to modernization). 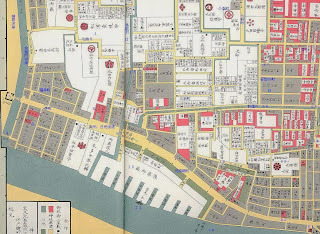 Even so, some thirty still remain, with sixteen prime examples clustered together along Chuo-dori, around 1 km north of the JR and Tobu stations, protected as Important Cultural Properties. The rice storage houses (kura) in Kuramae are a well-known landmark in central Edo. The Kuramae district, on the west bank of the Sumida river, is a very busy part of the city, and a very important one as far as the government is concerned, because this is the site of the government rice granaries, where much of the grain reserves for the city are kept. Kuramae is located on the west bank of the Sumida river, just a few kilometers upriver from the Nihonbashi area. It is also located close to the trunk road that leads from Nihonbashi to the ferry boat crossing at Senju, the junction point for all of the main roads leading north and east from Edo. The Kuramae rice trading and storage operations are an important concern of the bakufu. Government officials, and even the Shogun himself, have to keep a close eye on the operations of the official granaries, since rice is the basis of Japan's economy, and the size of the grain reserves can have an important effect on the entire country. The Shoguns have tried to restrict rice speculation many times in the past. However, since the rice merchants play an important role in ensuring that the rice market is efficient, and products are distributed to all parts of the country, it is almost impossible to completely eliminate speculative rice trading. The easiest way for the bakufu to keep rice prices steady is to maintain a large supply in kura (warehouse) districts around the country, buying and selling the rice as necessary in order to keep prices in balance. In this sense, the granaries at Kuramae could be considered as a sort of "Federal Reserve Bank of Edo." Kuramae is a very impressive-looking place, especially when seen from the river. The long rows of kura along the river bank -- with their whitewashed walls and high, narrow windows -- are an impressive sight indeed. The basic structure of the kura in Kuramae is not that much different from the granaries that farmers maintain in their rural villages. They have thick walls of packed earth, plastered over a wooden frame and whitewashed to fill in any cracks. The doors and windows are small, and kept closed at all times except when rice is being loaded and unloaded. This keeps the inside fairly cool and dry, to prevent the grain from rotting. However, the buildings in Kuramae are many times larger than those found in local villages, and there are hundreds of them arranged in long rows along a series of narrow canals which lead inland from the river. The rows of granaries are all concentrated in an area between the river and the main road. Facing the road, at the entrance to the district, are several large buildings where the traders and granary managers conduct rice transactions. All of the shipments into and out of the kura are recorded carefully in account books, and the summary figures telling the volume of rice in storage and the going price per koku are sent to bakufu officials once or twice a week. At harvest time the kashi (wharves), where rice is unloaded, are bustling with activity as boats from all over the country dock and unload their cargoes of rice. Usually, the jito (a low-ranking samurai who supervises production in a certain village or region) will travel to Edo with their rice shipments in order to ensure that the delivery is made safely, to get a receipt for their delivery, and to haggle with the officials at the kura in order to get the best price possible. The dock workers carry the heavy bundles of rice off the barges and up the steps into the granary buildings. After rice is harvested and dried, the farmers who produced it bring their tax rice to the home of the jito (the word "jito" literally means "head of the land"). There, the rice is wrapped in large bundles made of straw. Since each bundle is supposed to contain exactly one-fourth of a koku of rice, it is easy for the warehouse managers to quickly tally the amount of each shipment. Each bundle bears the stamp of the region and farm that produced and bundled it, so if the managers find out later that the bundles don't contain the right amount of rice, they can easily tell who is guilty of trying to cheat the Government. ©　edomatsu: Welcome to Edo!
. komedonya 米問屋 rice brokers in Kuramae .
. Kuramae Baka Monogatari 蔵前馬鹿物語 . of this warehouse . . . This is a greeting for his host, Boosen 防川 Bosen, a rich merchant with a large warehouse. Not much is known about this merchant. Two of his poems are in the Arano Collection あら野. Read the discussion of the translation here. Even if you do not drink sake, there is no promise you will get rich. So it is better to drink a little and enjoy your life. This shows just the opposite, a drinker in his storehouse, enjoying his cup of sake. In an early 17c book, the title of which H Mack Horton translates as Laughs to Banish Sleep, Anraku Sakuden plays with the old proverb in a poem which continues that "and a heavy drinker's storehouse has a hard time standing up." Ah, the original, literally translated is that "there are no storehouses raised by teetotalers" (i suppose that merchants need the social lubrication to sell goods and amass treasure to be stored. A verbal war between drinkers and non-drinkers in Japan goes back to the Manyoushu where we can tell the poems in favor of drink are responding to would-be prohibitionists or, at least moralists. The most interesting debates in poetry took place in mad poems and you may find a dozen or so on both sides (where the non-drinking physician Bokuyo defends teetotalers by attacks drinkers after a drinker put down teetotalers) in Mad In Translation. Mad poetry is probably the biggest storehouse of drinking poems. My favorite of Issa's drinking poems does not concern practical matters. It is the one where he takes a swig of sake for each stroke of his hoe or the vice-versa (my memory is of the approximate type) -- a playful take-off on the Chinese poet said to write so many poems per cup of wine . . .
Is the season of this haiku automatically autumn, because of the use of 'moon' without another season qualifier? natural world--the ever returning moon. The horizontal axis (Shirane) is reflected in the present moment, which offsets the pain of loss with the joy of moon viewing, and the hope for future harvests in the natural order of things. At least, this is my reading, at this point in time. If I have overlooked something that would be obvious to one steeped in Japanese culture, would you kindly let me know? I live in Arkansas, one of the Southern states in the USA that have been repeatedly hit by killer tornadoes since February. This reading of the poem above gives me a different perspective on all the recent television images of natural disasters in Myanmar, India, and China, as well as in my own region. Thanks for sharing it, and in the different translations. Gabi san thank you greatly for your information on Kura and Kuramae. Those show me wide guide to rice broker whose name Natsume Seibi. As you know he was a great sponsor as well as a teacher of Issa staying in Edo. I think Seibi is key man to understand Issa's character. 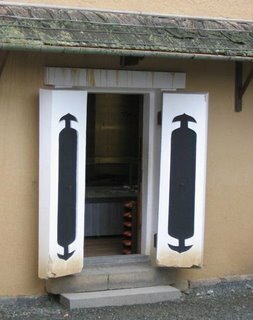 These storehouses were usually built some distance from the main dwelling or shop to reduce the risk from fires caused by cooking or heating. "One reason you see kura surrounded by modern buildings is that they were more likely than other traditional structures to survive fire and disaster," Kanai said. "It's very interesting to look at photographs taken immediately after the Great Kanto Earthquake in 1923, and the firebombing in 1945. What you see is a lot of rubble with just the kura left standing." 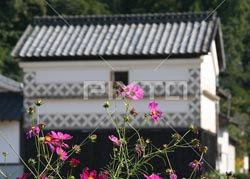 Even when people rebuilt by choice, they often took down the main house but left the kura intact. 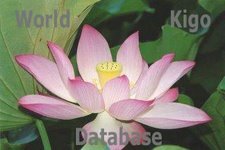 "A kura was a status symbol," Kanai explained. "It told the world you had something valuable enough to need protecting, and that you had the money to build one." In fact, the expression "kura o tateru" ("to build a storehouse") is another way of saying "to become a financial success." Building an earthen storehouse was indeed an expensive undertaking. First you had to lay a stone foundation to support the wooden frame, which was usually built with massive logs. Then you would affix bamboo or palm lathing to the frame, and apply layer after layer of clay to form the interior walls. When all that was dry, you would finish the walls by meticulously applying thin layers of a plaster called shikkui. It's shikkui that gives dozō storehouses their distinctive white exterior. Kobayashi Issa and his storhouse hurned down . . .